Are you surprised by God? “We like to put God in a box. We have the propensity to confine God to our idea of Him. “Do you live surprised by God? Stunned by what He says to you, amazed by what He asks of you, struck by what He does and bowled over by the scriptures? “If we are in touch with the real God, that continuous shock should be normal. He is amazing! He is shocking. What He does and who He is, are knowable and unknowable at the same time—a paradox. If we feel comfortable with this Master of Surprise, we may need to question whether we have met Him at all. God truly is shocking! We build tight religious circles to confine and control Him, but in doing so, we miss the outlandish freshness of each new day and each new situation. 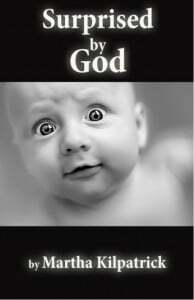 “To define God is to confine God and limit our experience of Him. When you want God to be containable or label-able, nameable and confineable, then you are the one who’s confined. Surprised by God is only available in digital format. I want to see God outside my box of confining Him to the familiar. My box is always to be safe from His startling ways, but that is unbelief. Now I want the Lord to manifest Himself in His true, spectacular strangeness. I want You to go beyond my imagination and let my unbelief be slain forever. You are the outlandish God of overabundance and I want to be a radical believer in You as You are, the shocking God! So to let Him be as He is takes us outside the container of our stilted ideas of Him. Shall I live a life of wanting to rule my God and miss the wonders of this Almighty Creator? Shall I play a safe game of delusion and refuse His upsetting blessings? What eye has not seen and ear has not heard and has not entered into the heart of man, [all that] God has prepared (made and keeps ready) for those who love Him? Yet to us God has unveiled and revealed them by and through His Spirit. To define God is to confine God and limit our experience of Him. When you want God to be containable or label-able, nameable and confine-able, then you are the one who’s confined. You will be blinded by your own boundaries and incapable of seeing Him when He moves around a familiar corner and startles you by the what-you-never-dreamed. We always think there is a destination or a conclusion, but there is only a journey. We will be discovering Him forever. He is that inscrutable. Just look at the stars each night. He is not limited. He is endless! So we lose Him and we miss Him because of our boxes. We are unbelieving of God outside our box. When we say “God is always…”—we reveal our box. Yes, God is “always the same: yesterday, today, and forever” (Heb. 13:8), but that doesn’t mean we know Him as He is. The wonder of such a God is we never will! All of life and time are the unfolding mystery of His being. The mistake of Adam and Eve in Eden was to live by the delusion of knowing, and that is to minimize God underneath my definition. They bought the lie that made them a god unto themselves: “I know good and I know evil.” No! We like to define everything – that makes us feel that we are in control. Inherently we prefer to live by knowing. The object of life is one thing only: to know God (Jn. 17:3). So all our propensity to label and categorize is…putting life to death. We would rather have our definition than mystery. Then we feel that we know: “I know what is; therefore I know what is coming.” And to know is to be in control. Or so we believe. To be under the control of Him who is actually IN control—ah, that is safer. To know is to die… To think you know what you don’t know is to die, because life is an unfolding force. Once when I was ill for an extended period, the Lord said to me, “My will is higher than healing.” And the pursuit of His will means that you cannot have any boxes because He can turn and shift you in a different direction at any moment. In time I was healed miraculously, but I had learned that the only reason for God to raise me to health was so that I could live again for His will! You will only know this spectacular, surprising God if you live for His will. And of course, you will only live for His will if He has come and inundated you with His love. You only want His will if you have been brought to believe that His will is the best and the greatest experience of life. We really function as if God is containable and knowable. We want a set order in our churches. We want to know exactly what’s coming and many times there is tremendous fear of letting the Holy Spirit have control. We fear that He will take control and He will – He can, He does! And sometimes – He doesn’t! We fear that He will instigate some outlandish thing that is out of control. Frankly, that is a risk you have to take with your personal life, group, or church because the only safety, the only pleasure of God that you will ever know, is from the Holy Spirit leading you and guiding you. The Holy Spirit is assigned to bring you God’s mind and convey to you what God is thinking about you, to tell you who you are. You don’t know yourself and I don’t know myself. I don’t know what I need. I don’t know really who I am. And when you abandon to the Spirit, you lose self-consciousness of who you are. You don’t care. But the Lord comes to show you that He knows you intimately. And that requires you to be wide open to Him, without any “no” toward Him. He has searched out every NO in me to Him – some I didn’t know were there. Our box is usually a negative thing rather than positive. When we say, “God is this way,” what we mean is, “I don’t want to let God be any other way.” So the boxes represent our effort to control Him, our ambition to be God and our secret hiding places from God. He is dangerous! He really is. But He never takes you where He hasn’t rehearsed you. He never shows you what you’re not ready to see, and He never asks you for what He hasn’t prepared you to give. He is utterly, perfectly aware that we are sheep. We are dumb; we are afraid; and He handles us by the Holy Spirit with such understanding and kindness. I believe that everything begins with prayer – with asking. Prayer is simply asking God. That is all we need to do. I have begged and prayed for the Holy Spirit to take absolute possession of me and control of me. We want to come to the place where we move by the Holy Spirit in deep instinct. Instinctively, we go here and there as He leads. You do it not so much by a voice as by union – by the fact that you are the Holy Spirit’s vessel trusting Him to take you where you need to go, and cause you to read what you need to read. If you follow the Holy Spirit, you cannot have any boxes. All boxes will be exploded. But then you will discover a universe of the magnificence of God that you never imagined before, things no one has ever taught you. No one can explain to you what the Holy Spirit reveals. Is there risk in such an endeavor? Yes! Yes! If you are not fully surrendered in your mind and heart and body, you can get off track into delusions that are NOT from the Spirit. But to walk in the Spirit, by surrender to the Spirit, by a commitment to do what the Spirit nudges you to do, is the safest place to be—the most fruitful and the most dynamic. Chambers wrote: “Don’t insult God by despising His ordinary ways in your life by saying, ‘Those things are beneath me.’ God has no special line; anything that is ordinary and human is His line” (“Disciples Indeed” from The Complete Works of Oswald Chambers). The Lord revealed Himself. He nudged me toward a card game, and He also revealed His knowledge of me to me. If I hadn’t instinctively followed the Spirit, I would have missed His riches. I wouldn’t take anything for the adventure of it! When you seek just to know God, you find Him in surprising places. Our God is everywhere. He rules in every place where He seats us. The whole earth is full of His glory and everything in it and of it belongs to Him. If our eye is on Him, that which is darkness has no relevance. We look at darkness and imagine that our fear is valid and that our fear of darkness is faith. No, it isn’t. God calls us to be in the light, to walk in the light, and then darkness will be evident. In the light we will know what to do about the darkness. And many times, we will simply leave it alone knowing and believing that it is irrelevant, already conquered. When you are moving in the Spirit of God, darkness is dispelled simply by His mysterious purpose and His conquering Presence. So that is what I ask for us…that we may see Him as He is and in all of His explosive wonder, to know Him as never before. May God bless this writing to you that we all may live in the childlike wonder of discovering our Most High God! This is written as Paul’s prayer for the faithful Thessalonians, but it reveals the incredible ability of God’s great power to cause us, at the end, to meet our Lord Jesus Christ in full purity and wholeness! This is the amazing POSSIBILITY of our completion and the surprising ABILITY of God to perform it for us. Our possibility. His ability. It remains only for us to believe this, because He said it, and then to…simply ask.